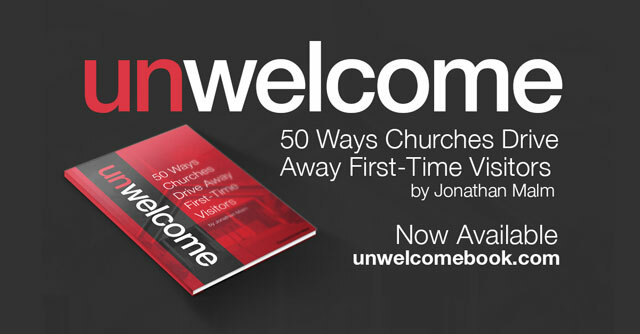 We’ve got a new book coming out by Jonathan Malm that about welcoming guests, Unwelcome: 50 Ways Churches Drive Away First-Time Guests. But these days first impressions are virtual. The book covers a few things to consider for your website, but the bulk of it is in-person tips. So let’s talk about those online first impressions. I recently asked some friends for suggestions of multicultural churches in my area. I’m not leaving my church, but I wanted to visit a few churches in the area. Since I’m not ready to church hop every week, my choices had to be limited. Unfortunately, church websites make it all too easy to cross churches off the list. I found two distinct categories of lessons for church websites: The church service experience and the website itself. One of the greatest things your church website can do is give first-time visitors a glimpse of what they can expect when they show up in-person. I’ve never really thought the length of the service was that important. You tell people when it starts and they’ll find out when it ends. But your visitors have busy lives. They need to know how long they’ll be stuck in your pew on Sunday morning. So let visitors know when the service normally ends. You’ll make it easier for them to plan the rest of their day and make sure church fits in their schedule. If the length of your service varies too much then you’ve got a problem. This isn’t a matter of the Bible vs. football, it’s a question of being considerate of other people’s time. 2. What’s the Dress Code? Telling people what they can wear is a no-brainer these days. You absolutely must tell people how they should dress so they can feel comfortable. And detail is important. One person’s “casual” is another person’s “dressy.” If your church is at all dressy, be sure to include casual crowd shots of your people so visitors can see whether or not their Sunday best will work. 3. What’s It Sound Like? Picking a church is hard. For better or for worse, the music style is one of the first things we use to filter our church choices. Accept that and use it to your advantage. You can’t hide the fact that you rock the old school hymns. If you mislead a visitor into checking out your service, you haven’t gained anything. They’ll never come back if they hate your music. So give visitors a taste of your music online. High quality audio recordings can be a nightmare, so don’t over-think this. Grab an iPhone and shoot some quick video of your worship team. Embed a few YouTube videos on your site and you’re done. This post on creating short videos might help. Just be sure to sort out licensing. A 30-second clip is probably fair use, but I’m no lawyer. If you’re unsure, use original material (with permission) or public domain songs. Children are the future, right? So what do we do with them during the service? This was a major question as I was looking at churches. Could I bring my kids with me? Would they have to sit through a 45-minute sermon? Or would I be signing them over to some Disney-fied experience where I’d wonder if they were being brainwashed (and having more fun than me). Spell out what the options are for kids and make those over-protective parents feel OK about dropping off their kids. If your church is known for being multicultural—and especially if you claim to be—your website better back it up. Don’t show me an overly perfect rainbow stock photo. If your church is really multicultural, you wouldn’t need stock photography. I expect real photos to show your diversity. And if that fails, I expect to see it on the staff page. No church can claim to be multicultural if the pastoral staff is all white dudes. I seriously came across a church in my area that claimed to be multicultural, yet the only people of color on staff were part of the janitorial team. Ouch. Your website can tell visitors what to expect. But the site itself will also tell first-time visitors a lot about your church. Be careful what kind of messages you’re inadvertently sending. One church in my area had a sticker-like graphic on the homepage that said “New to our church?” Perfect, I thought. That’s where I can find all the details I need. Yet clicking on the button didn’t take me anywhere. It was linked to the homepage. Huh? That’s either a really horrible design or someone never tested the site. It’s an easy excuse for potential church visitors to skip your service. Almost as bad as a broken website is an out-dated site. It’s early October. Your homepage shouldn’t still be promoting your VBS that started in early August (and sadly, this is a real example). When your information isn’t current you sow seeds of doubt in visitors’ minds. Is this place really worth visiting? Imagine it’s Sunday morning. A potential guest is running late. They jump in the car and go, only to realize they don’t remember exactly how to get to your church. At a stoplight they pull up your site on their phone to check for directions. Are they going to find what they need? Will your site even work on their mobile phone? Your site needs to help people get to your church, in some cases literally. If your site doesn’t work on a mobile phone, your visitors will give up. I don’t think anybody likes church shopping. It’s a constant struggle to find what you’re looking for. Your hopes rise each Sunday and too often they’re dashed by churches that don’t feel like home. Help first-time visitors decide by making your website more helpful. For more great tips on welcoming first-time visitors (or what not to do), check out Unwelcome: 50 Ways Churches Drive Away First-Time Visitors by Jonathan Malm. Reach out to me if you’re interested. We work with UMCom and might be able to help. We have recently been new movers into a new community. We’ve planted two churches in prior cities, and at the moment, are shopping for a church to involve our family in this new stage of life. Websites are really important to us in our search. I ruled out a few visits simply because the dysfunctional website with broken links, poor navigation, and hard to find information. In some cases, the address and service times are not easily found. In other cases – under construction. The thing that really got me the most was either no answer or 10 days to answer inquiries via social media, accounts. We filled out contact forms, tweeted, facebooked all in attempts to reach somebody. I’ve experienced these things first hand. Most of these are really easy fixes, as long as someone is paying attention to it. Thanks for raising the bar here. We took the ‘First Impressions’ post very seriously in the latest design of our website. This latest post here has been a great rehash as to whether or not we are accomplishing our goals and I want to first thank you guys for all of your work that so greatly benefits the local bodies that serve all communities. Awesome! I’m glad these posts are influencing churches. Thank you for the post. I’m knew to the site and am now just reviewing a bunch of posts. Our church has traditionally been poor at welcoming visitors. We’ve had some leadership turnover (for the better) and I think we’re making great strides now. We’ve redesigned our website which I’ve taken over now. It is very basic so that we can easily keep it current, but at the same time we worked hard at incorporating all of the best practices we could identify. I just finished your post and immediately updated our Sunday Worship page with length of service and a bit more information about child care. Obvious stuff, but something we missed. So, thanks very much.